After taking the A1 from Hanoi south, it was time to head to a more scenic, traffic free, and rolling road – the Ho Chi Minh Highway (HCMH). 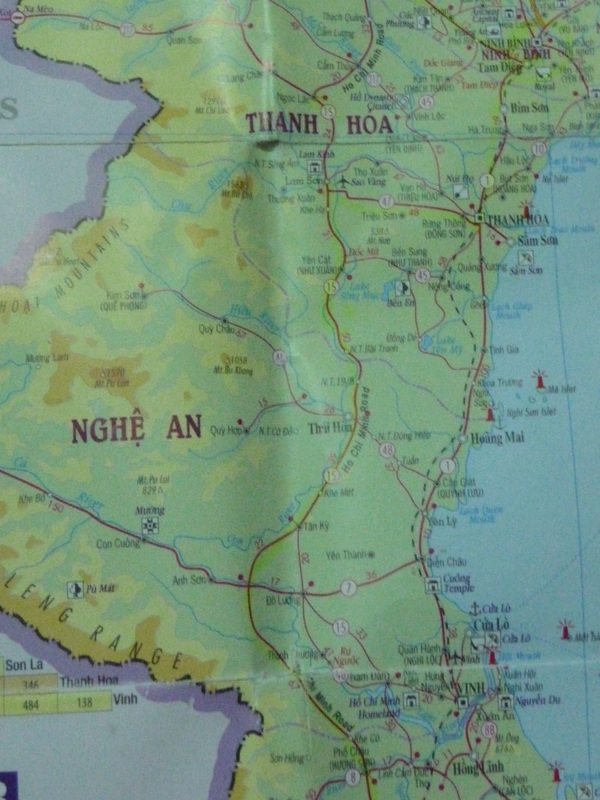 We had the entire afternoon to head west from Ninh Binh to the HCMH so we figured that we could gain a bit of distance southbound as well, however, we weren’t prepared for every outcome. As we didn’t have any form GPS and a tourist map that didn’t delve into specifics we knew we’d have to ask for assistance, which after our Indonesian experience we figured would be a breeze. Pulling over on the side of a busy road I decided to test my theory. I pulled out the map and spoke slowly, pointing at the destination we have in mind. I was quickly give a nod and a point to the right, so I said thank you, hopped on my bike and turned right with a smile on my face. About 10 minutes later we again decided to ask for help, I mentioned “Ho Chi Minh Road” this time, and was quickly given a nod and a point in what I assumed was the right direction. However, after having some trouble with our route we quickly realized that everyone we were asking was simply nodding and pointing in any random location! Unlike Indonesia, locals in Vietnam rarely speak any English, and at the sight of a random westerner they simply nod or shake their head to get you to leave. So we pulled over at an internet café, turned of google maps, and quickly found where we’d gone wrong. Although we were a little detoured I wasn’t worried, we still have a solid 3-hours to head about 60km, which was more than enough. Turning west onto the correct road I began to hear a strange bubbling sound. I took out my headphones to get a better listen and it was very clear that something was wrong with the exhaust. Pulling over and taking a closer look I realized the problem – the exhaust, which was be re-welded about 4 times had heated up and simply popped off. My first mechanic stop, but nothing I hadn’t expected. 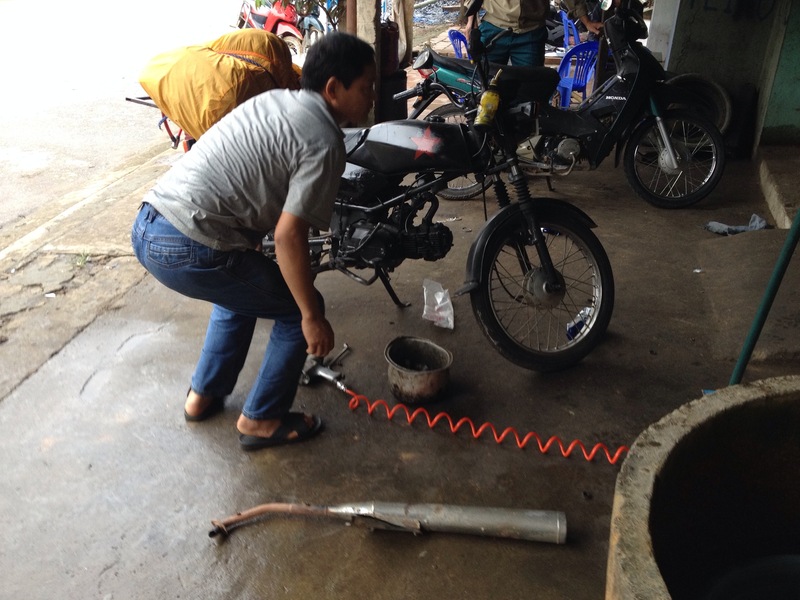 I could have it re-welded for about 100,000dong ($5), or simply get a whole new exhaust for 250,000d ($13USD). I decided out with the old and in with the new. Now it was getting late, and our hope of gaining some ground south seemed only a glimmer as the sun began to set and the blue sky faded into darker and darker shades. We reached the infamous Ho Chi Minh Highway just in time. Before we knew it, it was completely dark outside and we needed to find a place to rest our head. We were in the middle of a village about 300m long, and after playing a few games of charades with some local Vietnamese we were directed to a small hotel that tried to charge us 3x a normal room rate before we were able to bargain it down. Although we’d expected to gain much more ground, we were just happy to have made it to the correct road and the next day promised to be smooth sailing. As planned we were up and ready by 6:30am, before even grabbing a bite we loaded our bags and set off south on a road we knew we’d have no problem navigating. The Ho Chi Minh Highway starting west of Ninh Binh down to Phong Na is a well paved, smooth sailing road where you can cruise at 60km/h, taking in the beautiful landscape of Vietnam, and see another vehicle every 5 minutes or so. The day had started smoothly, and all was well. Pulling over for a quick stop I noticed a small black puddle form underneath the bike and it was a clear oil leak. For the second time I pulled over at a mechanic shop, explained my problem, and ate breakfast as the leak was solved. 70,000dong ($3.50) later and we were back up and running. We’d been on the road since 7am, and by 5pm we knew we needed to stop for the night. Although we’d hoped to make it all the way to Phong Na, a quick detour running out of gas detour, and a few other pit stops put us up another night in a random spot known as Ha Tinh. We’d make it to our spot the next morning. So far, we’d vastly underestimated the length of general size of Vietnam, ran of gas twice (Rose’s bike) and I’d had two pit stops at the mechanic, I was pretty happy with everything.